We arrived back to the boat a couple of days before the 1st, sooner than we’d planned but still in plenty of time for the beer contest. Beer: We brewed our first beer on the boat, which I apparently neglected to mention in previous blog entries. Mostly I didn’t want to give away what we were making, what type, or how much, so the judging could be fairer. I’m not sure that happened anyway. The beer was an America Amber category, and we moved it to a specialty beer category (Fruit, 29B I think). We had a red beer (still in Amber category) with cherries and honey. The hops were a specialty hop – and for some reason the judges didn’t like the hops with the fruit beer. I suspect had we simply made it a Red Ale, it would have likely come in First or Second. The judging was taking place between the 1st and 7th with the get together and announcements on the 8th. 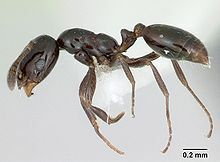 The little black ant is a species of ant native to North America. It is a shiny black color, the workers about 1 to 2 mm long and the queens 4 to 5 mm long. They are present in almost every region of the USA, and most of Europe. From what I’ve discovered, they can live in the Earth in little built up colonies of up to about 2000 individuals, or they can get into cracks and crevices in your home, in the walls, under and in the house – or in my case, the boat. They are living apparently between the teak wood making up a vast amount of the inside of the ship and the fiberglass walls. They can have multiple queens in a single colony and they generally don’t get very large colonies. Hosing them down with chemicals is rather out of the question. Bug bombs won’t penetrate into their living areas. And spraying chemicals that could conceivable kill me around the interior of the boat is, for me a No-Go. Also, the aerosols used can be flammable and on a boat, explosive. We use sparkers on the stove to ignite the burners. So being sure all the fumes are out… not a good idea. I know from previous research into this stuff, that boric acid will kill most insects. Mostly, all they have to do is walk through it and they ingest it. It desiccates them from the inside out. It is an abrasive and works on their exoskeletons. It has an effect on their nervous systems as well as it disrupts their intestinal digestive systems. The best part about boric acid (and borax) is that they eat it, return it to their nests and feed their young and the queen(s). Who, in turn, die. I am, I believe dealing with not one, but two colonies of ants in the boat. One colony lives forward in the boat, the other in the galley area somewhere behind the wood. We tried boric acid powder, which has had no effect on them. I tried the Tero type traps which are a liquid, and they spill and make a mess. The first time I put one of those out, the ants went after it instantly. And then stopped after a day. I think they figured out not to eat it. Or they weren’t returning to the nest to get “helpers” to come get the food source. Others I’ve spoken to on Facebook swear by that stuff. Yesterday, I picked up some Raid ant baits. They are four small traps with a different sort of chemical inside called Avermectin B1. It too, is a nerve agent and will disrupt their bodies after they ingest it. It is a small enough quantity that they will take the food source back to the nest, and like the other stuff feed it to the young and queen, who then die. Last night within thirty minutes of putting out the traps, three in the Galley and one in the forward cabin, all four traps were covered. Ants were coming out of tiny crevices under the wood to get to them. And they were going off in force only to return later with more ants. Eventually the traps each had somewhere around 100 ants on them. This morning, there is not a single ant floating around in the Galley. The forward cabin however, in the floor tells a different story. There are still dozens of ants scurrying to and fro to get to the food source. I have to assume that one colony in the front is MUCH larger than the one in the back. And the one in the Galley has been wiped out, or at least pushed back to the brink of Apocalypse. I can only hope. I also hope there are no “Prepper Ants” who are going to come hunt me down in the middle of the night. We think that any ants that survive will eventually die due to starvation or, they will come out and get the traps and die from the poison. I hope they are gone within a few days. We will keep you posted. Cleaning and Preparation for Sail: I went back to my regular part time job at the marina, and have been scheduled a few hours, and a few days off each week to work on the boat to prep for a sailing trip in a few days. We’re thinking of either just sailing out for a few hours and knocking the dust off the rigging, or even heading for Georgetown for a day or so and then coming back. Weather permitting. Unfortunately, the heat and humidity have been stifling. I need to reinstall the jib (I took down before departure from the boat, to prevent any wind incidents, ripped sails etc) and put all my running rigging back. I also need to drop the main, replace a line going to the furler. I’m sure it will be fine, but it’s getting old and somewhat worn and I don’t like the idea of it snapping at a critical moment in time, like, say a storm or something similar. You always have things go wrong when they shouldn’t, and keeping equipment right helps prevent cascade failures. But, man, that’s a lot of work in this heat. But it’s got to be done too. JoAnne has a lot of things to stow. I have to remove a few things from the forward cabin and will probably just stow it in the car. We’re considering a small storage locker to move a few things too (larger things which we probably do NOT have to have on the boat right now) and a few things we can just remove altogether. We have two coolers, both of them can come off the boat, though JoAnne and I are at odds on that. I want them off, she thinks they should be here. We’ll come to some conclusion sooner or later before we leave for the Bahamas. I’ve removed most of my tools from the boat and left a small bag with a few. But, honestly I don’t need my power tools when traveling. Just at the dock. I DO want some of the heavier wrenches just in case I need them to repair something I’ll need them for (like an engine!) – and they are, unfortunately, heavy as well. Then we have dirt for the composting toilet. Not a lot, but it’s bulky. Can’t seem to locate coconut coir around here. Not sure why. Supposedly it’s more compressed and can store better. I have yet to see it or locate any. I hate ordering things over the Internet without being able to see them. Wind Generator: Think I have decided on a wind genny. More on that next time, if I buy it. 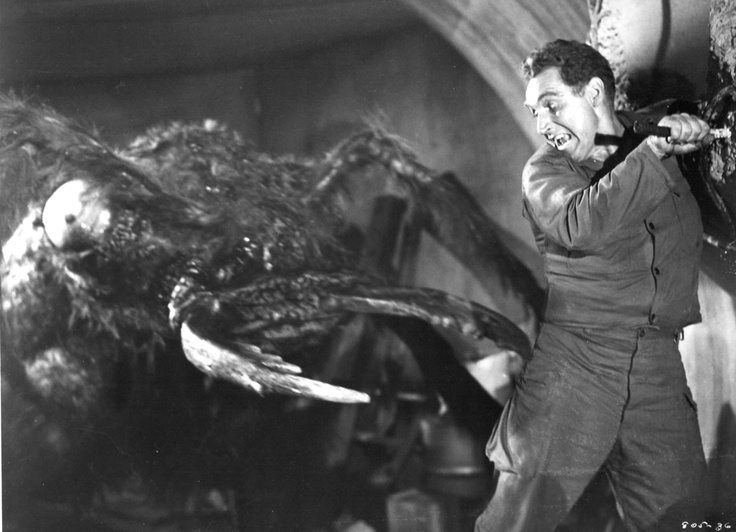 So, in conclusion here… ants. They are hateful little things, getting into everything. But, they can be controlled and eliminated if you are persistent I think. Beer making on the boat is a difficult task, but we can do it. It’s just that there’s not that much room and it takes both a steady hand, and steady water ( like that of a marina) to make it work. Catch you all on the next entry. A few days ago we discovered a broken bracket holding the alternator. It was not something I was going to ignore, and certainly wasn’t going offshore with it broken like I found it. The forward part of the L-bracket was shattered. One side (aft) was still holding solidly, and the bolt was going through the two pieces. However, a broken alternator bracket would cause vibration (which it did when it broke) and eventually would have torn the belt to shreds. Therefore I called for a mechanic because I haven’t any way to do welds, and it’s one of the skills I don’t have (but I certainly am going to look into learning it now). I am sure that I could have accomplished all the work the mechanic is doing, and if there’s ever a “next time” I’ll do it. I’m am not the worlds best mechanic, and honestly, I don’t like getting dirty inside engines. And since we’re on a dock, and I’m already paying for it… might as well have a professional look things over anyway. I’m glad I did because I’d never have seen the exhaust leak before it killed us. Technician came out rapidly (he was on-site), removed the bracket, did some testing and we discovered with our faces in the engine that the manifold was blowing a lot of exhaust out into the engine compartment. 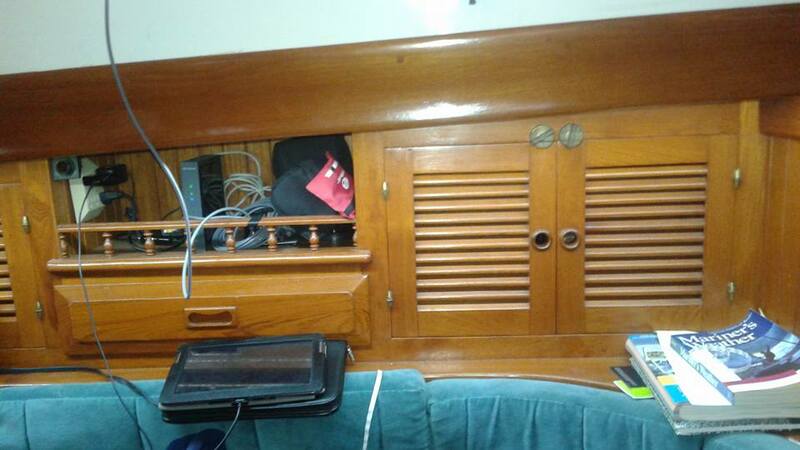 Well, that opens into the bilge and cabin. Long story short, that needed repairs so we didn’t… umm…. DIE. He did attempt a repair, put new gaskets in and had the welds accomplished. There was an extra bracket installed which was causing some of the problems with being misaligned! But other issues ensued as well. We noted some oil leaks (but had a hard time finding them exactly, finally he found them and one, the least one, is on the timing cover. The major one is the valve cover area, and the gasket (after looking at it) is pretty old and ate up. It’s either original, or it’s pretty old. On Friday last he said “It will probably be Monday before I can come back”. We said “OK” and then went and rented a car from Enterprise on their weekend special (10 bucks a day for Friday through Monday morning, giving us almost four full days for 38 bucks). And Jason called and came back on Saturday to repair things because… he got the parts in sooner. Haha. Ok, now we’d paid through Wednesday and had to extend a few days. Today is Tuesday. We used the car, turned it in yesterday. Made a trip to Wilmington to find a Radio Shack and some parts I needed for electrical project I was doing. (I found one, and 45 BUCKS later, I had my little project boxes, toggle switches and a fan for our bathroom and the composting toilet, which I’ll do at a later time when I have all those parts…). So, it’s raining like hell yesterday after dropping the car, so we duck inside the Dead End Saloon up at the top of the hill to wait out the rain and we run into Jason who is running back and forth from the boat to the truck for tools. The valve cover DOES need a new gasket, badly. The timing system isn’t as bad. The mixing elbow from the exhaust is pretty bad, but we don’t know yet how bad. The injectors are spitting fuel through (which is what causes the white smoke on startup). The manifold attachments are missing a couple of nuts, but worse, even after new gaskets and sealing, it’s not good. The thing has overheated and is slightly warped. Bottom line, has to be retooled to make it flush again. The valve cover needs removal and gasket replaced. The timing area (a bunch of gears connected to the crankshaft) leaks oil and SHOULD be replaced but that’s a pretty big job. The mixing elbow, once removed is trashed inside. Pieces of it are missing. Causing back pressure. Anyway, we should have rebuilt injectors, new gasket on the valve cover, and a new mixing elbow, a replaced bracket on the alternator (and it is now PROPERLY aligned, which it wasn’t, which has been causing most of our issues with belts and vibration in the past). Right now the engine valve-rocker cover is off and everything is covered with cloths. Elbow is off. Injectors are gone. Fuel is all shut off. We’re stuck on the dock for a few more days. I spent today working on our lighting. I don’t like the incandescent lamps (good for reading, bad for the batteries) and the LED lamps I’ve used don’t give us quite enough light for the interior when it is pretty dark outside. 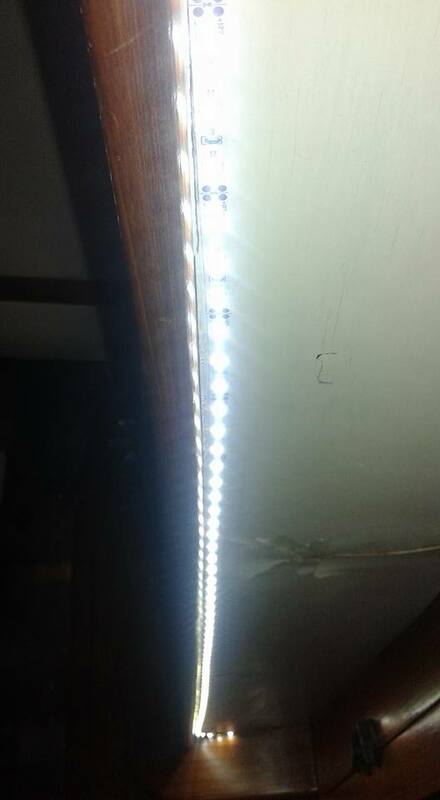 A few months back I bought three rolls of LED strip lights that work on 12VDC (I had bought a tube of them at the hardware store before that, and discovered they were set up for 120VAC and it wasn’t an adaptor, but rather they use resisters and diodes to drop the voltages down to what LEDs can use, a couple of volts each). Anyway, I can use the tube lights on the dock, when we have AC power only. I couldn’t modify them safely to work with DC. Instead I bought the strip lights and put them in my little project box. I needed toggle switches and a way to mount them. I considered three or four methods including little project boxes, but Radio Shack is the only place to pick those up (unless I order them online from someone like Jameco, Digikey or someone similar). I haven’t been anywhere that I could really order things, long enough lately to do it, so… RS it was. So, I collected parts as I could. A while back I saw someone else’s work with LED lights and liked their stuff. It was Acadia, Jon and Marcia’s boat. He had used little boxes like I wanted to do, and had mounted them using sticky tape (all of the parts are very light). Today I put everything together and installed strips of LED tape on both sides, under the area where the grab rails run along the length of the ship. So the settee area is now well lit when you turn on both sides. I doubled up the starboard side for JoAnne because she sits on the “couch” a lot and reads there. She has extra light for book reading now. She loved it. The next few images show the parts, and some of the tools I used to do the job. The boxes are simply mounted with “doubled-sided-sticky tape” (the 3M stuff) and I tied the wiring to the existing lamps because honestly, I don’t feel like ripping out the wood that is between the overhead/deck above and the lamps. 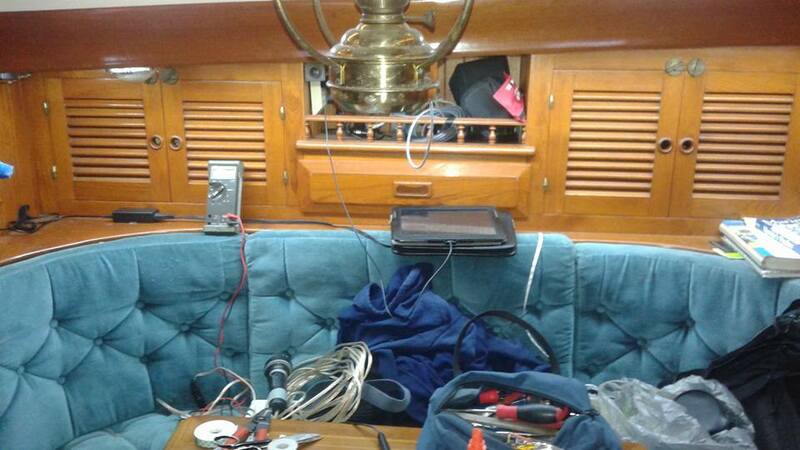 There’s a hand full of wiring running inside there and if I take it all out, I’ll be rewiring the entire boat in no time – and I don’t have the time to start that project right now. haha Eventually, but not now. I want to be able to sit there and read, look at charts at the table and even do soldering (like I did today with my makeshift light you see in the background, which doubles as an emergency anchor light). The wire has sufficient current carrying capability for very short runs. I wouldn’t use it for something other than LED lights. It’s really meant for speaker wires, but it’s 16 gauge and can handle about 3 amps of current. These lights pull about 500 milliamps (1/2 amp) on either side. So a total of perhaps a bit under 2 Amps. 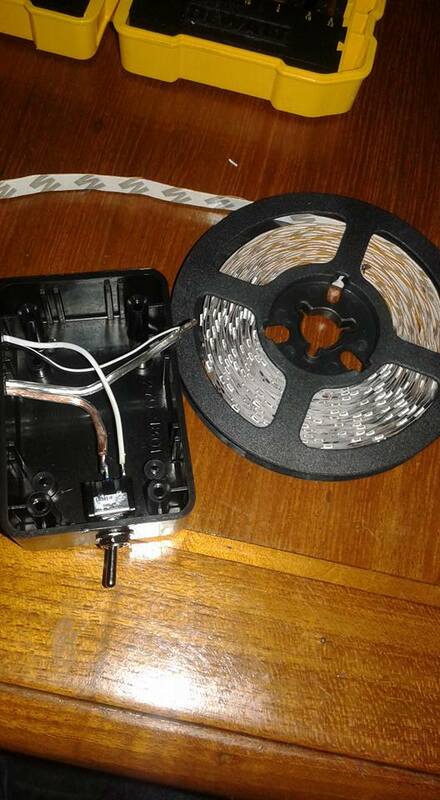 Close up of the LED tape strip, and the internal part of the switch box. 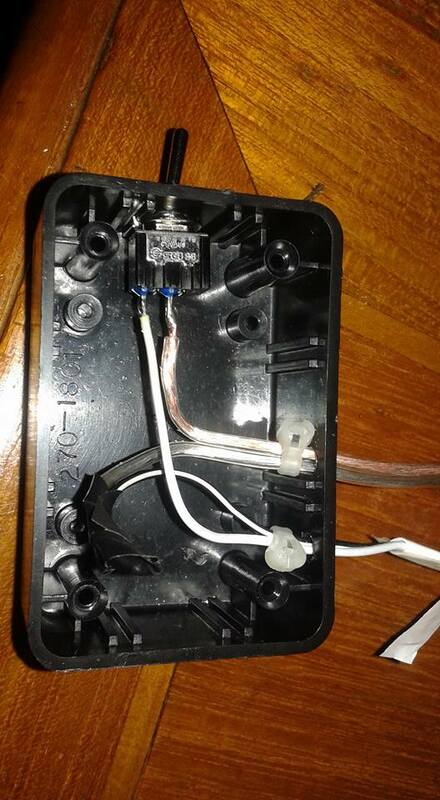 The wires are soldered internally and there’s a feed that is attached at the existing lamps using crimp connectors. 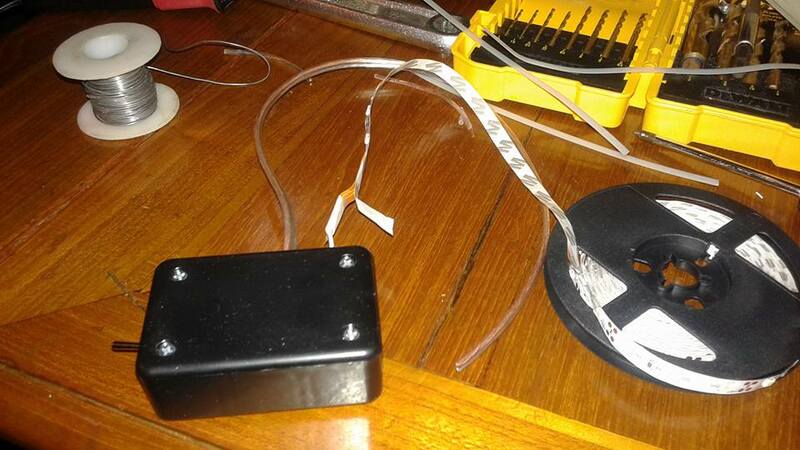 Used tywraps as strain relief inside to prevent accidentally pulling the wires from the box. Since it’s inside of a box I used a bit of electrical tape to insulate the soldered connection. 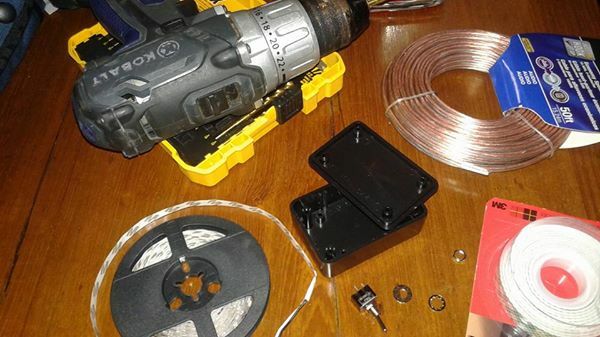 It is inside a box which no one will see (except here in a picture) so I wasn’t looking for elegant or neat, just “good” and besides, I don’t have any shrink tubing or I’d have used that instead (old electrical wiring habits die hard sometimes). The finished box. Double sided sticky tape goes on that side, the whole thing gets “stuck” to the overhead (under the grab rails on the bulkhead) and hopefully will hold for a few years. I cleaned the surface with acetone before sticking things in place. It’s painted with a flat white paint, so cleaned right up and the LED tape is also “3M” tape so it ought to hold a long time. 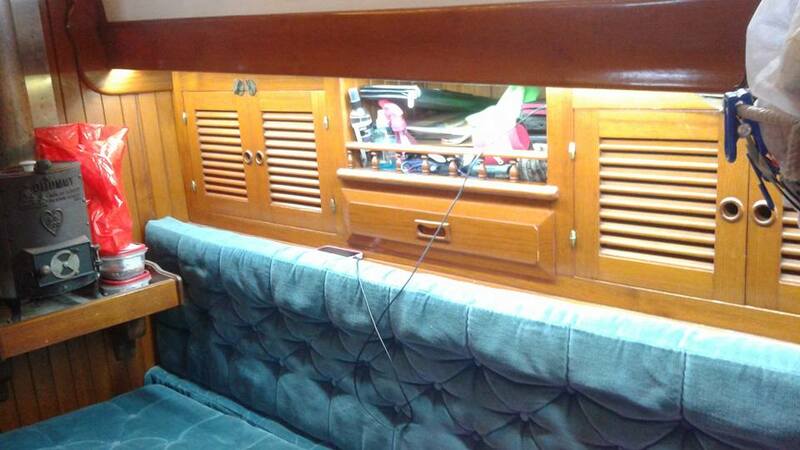 Starboard side, double strips front and back. Port side only has one strip. Sometime in the next few days if I get a chance, I’ll do the same thing with the galley area, because it’s in the walk-through to the aft cabin and very dark. There are four lamps, two under the grab rail area, one behind above the engine, and one on the over head. None of them provide enough light for the galley, or working in the galley, so that’s going to change soon. Last entry, we had planned to continue down the ICW. At some point along the way, we changed out minds for the 20th time. I think the stress of going in the ditch is less than the stress of going offshore at night for a 24 hour run (or in this case, 14 hours overnight). So, we decided, one more time to go outside. On 27 November 2016 we departed the Morehead City Yacht Basin marina and had a LOT of issues getting out. Currents kept pushing the boat the wrong way and neither bow thrusters, or the prop walked were helping me get out cleaning. And on top of that, I think like a rocket scientist and pressed the WRONG button on the bow thruster. So, for the second time in a month or so, I whacked the bow pulpit. No damage, but it’s irritating as all get out. Adventure’s bow is long. There’s a 9′ bow sprit and 7′ of that are at the pointy end of the boat, along with the railing, the platform and the forestay, making it difficult (to me at least, I’m sure there are some Gold Star Captains out there who can drive better than I can) to see what I’m doing, aim the boat properly and I’ve just not got much experience with currents. Most of my sailing was in lakes, and places where the winds did what you expected. Anyway, once out of the dock without smacking anything else, we powered up and headed for the channel, made a call to the bridge. And then promptly made a fool of myself for the second time. The “Beaufort Bridge” answered me. Apparently they handle the Beaufort Bridge (which honestly, I wasn’t suyre where that was located) and the train bridge I had to traverse as I came around the corner leaving the marina’s channel. They told me the bridge opened on the hour and half hour. I couldn’t SEE the bridge until I was right at the end of the channel and I wasn’t sure what I was going to do if the bridge were down. Long story short, it was opened. I turned to starboard and pushed through – or thought I would. A small boat decided to bust through as I was heading in. So I slowed, to allow the faster boat through. He slowed. Now, I’ve got no steering in a few moments, and he’s taking his time coming through. I call him on the radio and invite him through. SO… HE SLOWS MORE. Finally, I gave up, gave the boat gas and aimed right at his bow (I’m still a hundred yards away) but I think he got the message and suddenly powered up and got out of my way, because I can promise we weight about 34,000 lbs (dead weight, after being lifted on a lift) and I suspect he wouldn’t have been in one piece after an “encounter”. Finally, through the stupid bridge we were headed for the Beaufort Inlet. The time was about 2:30PM or so. The plan was to get out to the sea buoy by 1600, turn on a course to bring us to the sea buoy near the Masonboro Inlet in 14 hours. It was a long, chilly night. I left the enclosure up and drove through the night, running the engine the entire way. I did have the main sail up for a few hours and reduced the engine RPMs to keep my speed at around 4 knots, which would put me at the sea buoy at about 6:30. Along the straight line course I drew on the chart was a “Danger Zone”. After investigating I discovered it was a shooting range for Camp Lejune and sure as shootin’ (see what I did there? lol) USCG came on the air when I was just getting to the first light and announced live fire operations on-going in the vicinity. I ensured I cleared the outer lights by a couple of miles just to be sure. I didn’t want artillery shells dropping on me. Daybreak happened about 5 minutes before I reached the seabuoy (and I had to slow the boat as couple of time to ensure I arrive at the right time to still see the flashing lights and then spot it with my eyes. I actually drove within about 100 yards of the bouy. The Autohelm was running and it is “off”. I’ve since fixed the issue. Something in our closet made of metal was too close (within 4′ of the electronic compass). JoAnne had been sleeping down below and I called her and woke her up, asking her to join me in the cockpit when we were about 4 miles from the inlet. We arrived and dropped anchor at 0840. Ten minutes after my calculated/predicted time. We did have some issues getting into the inlet due to winds blowing the tide about, and apparently an opposing current, but once we were actually past the breakwater, it calmed considerably. We decided to stay here a few days, as these 24 hour shifts are a little much on me these days. I was grumpy, tired and grumpy. Did I mention, grumpy? JoAnne let me sleep for a couple hours and made a wonderful lunch/dinner. Baked Sweet Potatoes and boiled shrimp. Wish I could say I caught them myself, but I didn’t. I’m still not quite ready to be fishing and driving a boat at the same time apparently. haha Especially not with shrimp nets! It has been raining on and off now since we arrived. We have plans to depart here tomorrow morning and head for a marina on the ICW to spend about three days, giving us a chance to get internet and do some weather planning. Our next trip appears to be outside to Charleston (or perhaps a short jump, but I’m not seeing anything very nice for us to work with at this point). Yesterday, I dropped the dink in the water, got the engine on it, and we puttered into the municiple docks near the bridge and went to a little place called King Neptune’s, a little resturant/pub. Had fish and chips and a couple beers and came back just before it opened up again. I got the dink back on the boat, everything tied down and ready for evening. The rain came with some wind. And the wind remained. ALL night. I was worried about dragging so I didn’t sleep almost all night. I set two anchor alarms (one on the phone and one on the GPS) but the winds were almost 38 knots at one point. Predicted was 16. I have no idea what was going on. I checked three or four applications on my phone and no where was the wind supposed to be over 16 knots last night. Two other ketches were riding to anchor near by, and one sloop. The sloop was getting their asses kicked by the rolling they were doing. I can’t believe anyone aboard slept a wink last night. But maybe they did. Maybe they are “Saltier” than me? The other ketches were doing the same thing I was doing. Riding up and down, and turning into the wind against the waves. I tried a few tricks but nothing helped. I gave up and finally fell asleep about 3 AM for a bit. The wind was dying down then and I wasn’t worried any more about dragging at that point. Right now, I am writing this on generator power, needed to get the batteries topped off, and I need to check the engine for our trip south tomorrow., but JoAnne needed hot water for dishes and such, and I wanted to get this written while I had time and was thinking about it. I’m going to put up a hot spot and post it shortly.